Apple cider is one of my favorite holiday drinks and when I saw that Food Network was featuring an Apple Cider Snickerdoodle in its 12 Days of Cookies this year, I knew I had to make it. I took a quick glance at the recipe and determined I already had all the ingredients on hand! Picture me in my computer chair doing a happy little dance, like you do in the car to your favorite song when you think no one's looking. I was totally doing that. Christmas baking really wasn't on the agenda for this year, but with the awesome new neighbors who have been dropping things by, well, I was pretty much guilted in to it. We had no idea we moved in to a real neighborhood with people who came by to borrow cups of sugar bags of cat food. Houses are decorated and tonight, we even went caroling. The only real problem with me making the cookies was my hand mixer bit the dust. Actually, it caught on fire. Completely burned out the motor. A new hand mixer was on my Christmas list. I gave D that "please-pretty-please-I'll-even-share-some-cookies-with-you" look and he gave me that "you-ruin-Christmas-because-you-want-all-your-gifts-now" look right back. Party Pooper. Instead, he built me some new shelves (pictures coming later) so I could have easier access to my Bosch mixer. And, basically no real excuse not to use it more frequently for things like cookies. I began assembling the ingredients for the cookies and hit a bit of a snag. Apparently, I'm out of cream of tartar. That's kind of one of those things that makes snickerdoodles, well...snickerdoodles. Then the second snag...the apples? They're supposed to be dried apple chips. I only had fresh. And, it looks like I was supposed to use fresh apple cider instead of apple cider mix. In a last ditch attempt to avoid a 10 p.m. trip to Walmart, I looked in my pantry and discovered a box of snickerdoodle cookie mix. My mind began working and I figured, what's the worst that could happen? In a small sauce pan, mix together 2 packets of apple cider mix and 2 C hot water. Bring to boil. Let it reduce to a syrup, for about 14 minutes. It makes about 1-2 T of syrup. Cool slightly. In a large mixing bowl, blend together snickerdoodle mix, apples, apple cider syrup, egg and butter. 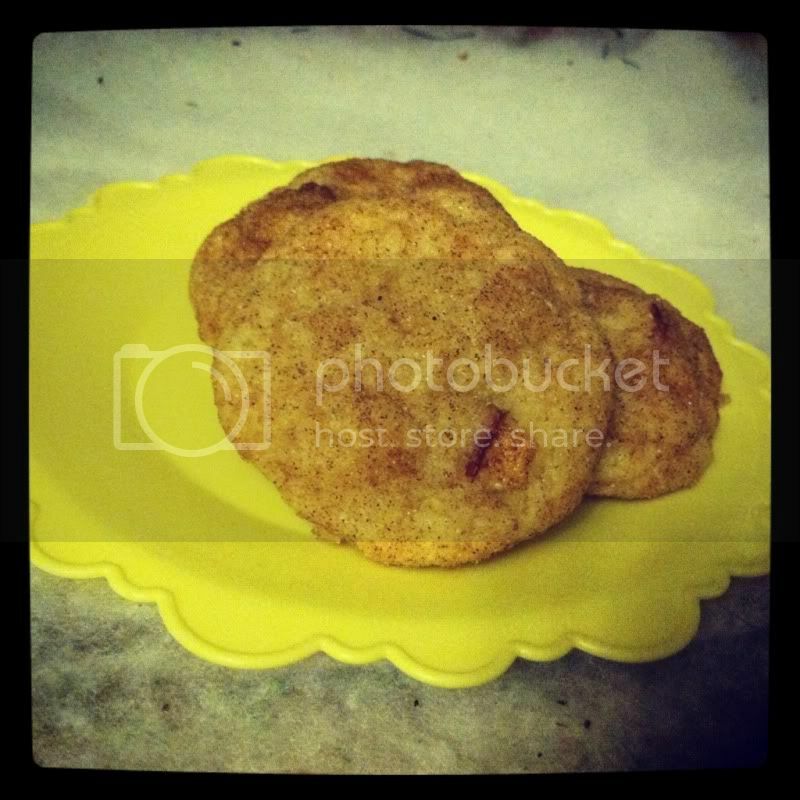 In a small bowl, mix together about half of the snickerdoodle cinnamon topping and the remaining apple cider powder. 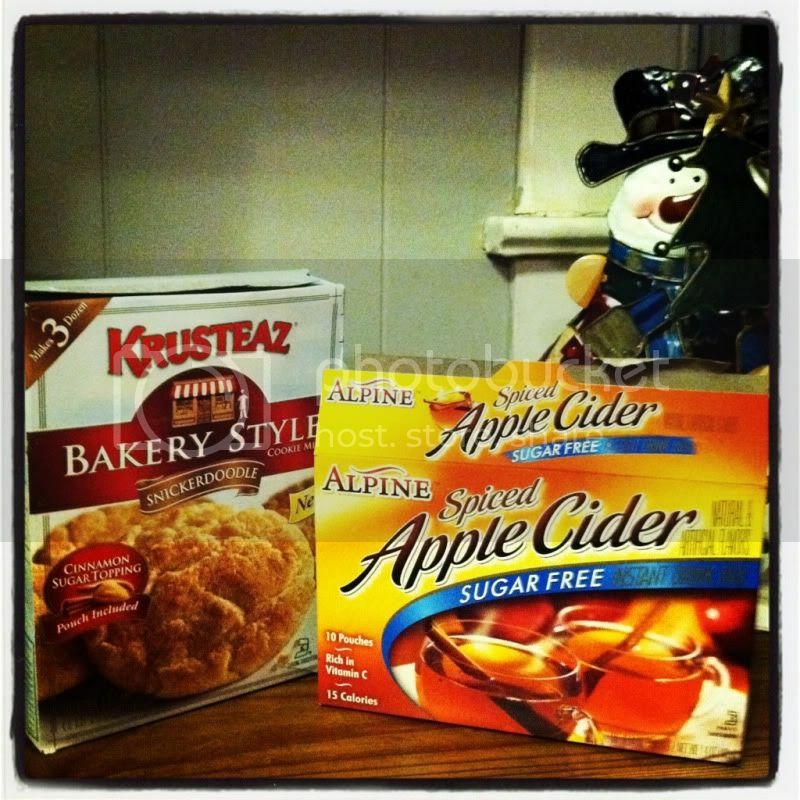 If this is too strong of a apple cider flavor for you, add more of the cinnamon topping to the mix. Roll about 2 t of dough into a ball, then roll in the apple cider-cinnamon mixture. Place on ungreased cookie sheet. Bake in 375 degree oven for 9-11 minutes. Let cool about 2 minutes on pan before removing to cooling rack. Next time (and there will be a next time) I will add more apples. I like a bit more chunky cookie. I am debating on whether to change the cinnamon to apple cider powder ratio. I like it tangy, but it might be too much. If you do try the recipe, let me know how you've found the ratio to be most pleasing. Adding more syrup into the dough may also give a more apple flavor if you don't care for the tangy cinnamon topping. Oooh! I bet these are delicious Micki! Thanks for sharing! Ya know I don't think I've ever had a snickerdoodle. This sounds like a really yummy recipe though. I know my kids would probably love it. Anything with apples and cinnamon is worth trying! These look delicious. I will try them soon. G'day! I don't think I have ever had a snickerdoodle too! You cookies look YUM!